Would you rather eat your coffee? You can now get your coffee in bar form, thanks to donut purveyor Krispy Kreme. 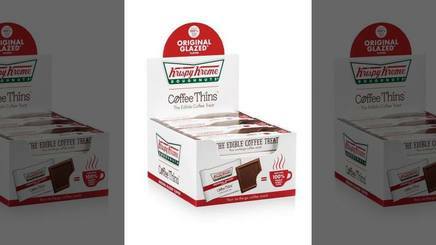 Krispy Kreme Coffee Thins are described as a “revolutionary edible coffee treat” made using a patented technology process that infuses the donut chain's signature coffee flavor into the chocolate, according to a release. The bars come in three flavors: Original Glazed, Caramel Macchiato, and Cappuccino. They are available at participating Walmart, Food Lion, Southeast Grocers and Southeast Circle K convenience stores in the U.S.
Would you try them? Would you replace your morning cup of joe?